Everybody loves a great gift, and this month until the 29th of September (next Saturday!) 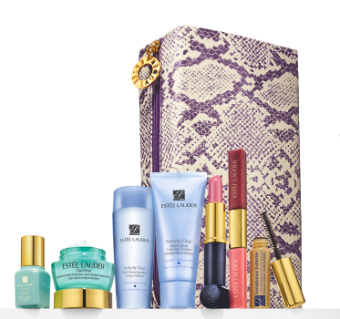 you can get your hands on this fantastic Gift With Purchase offer from Estee Lauder – worth £60.00 (€80) – when purchasing two or more Estee Lauder products (one has to be skincare) in Debenhams stores nationwide. The gift is a luxe makeup bag packed full of fantastic goodies and make-up essentials – a Pure Color Long Lasting Lipstick, a Dual-Ended Pure Color Gloss and a Sumptuous Extreme Mascara. You can even choose which skincare products you want, tailor-making it to your skin’s needs (either Advanced Night Repair, Resilience Lift Creme, Soft Clean Cleanser and Lotion, or Idealist Even Skintone Illuminator, DayWear Creme and Perfectly Clean Cleanser and Lotion). It’s definitely worth checking out either for yourself or as a gift to someone else and great if you’re travelling soon as you can take it in your hand luggage. Definitely something to brighten up a rainy Monday! This entry was posted in Skincare and tagged Debenhams, Estee Lauder, gift. Bookmark the permalink.